According to new research, poor diet accounts for a fifth of all deaths globally. We all know that snacking on a handful of cashews is way healthier than tucking into a packet of chocolate biscuits when the 3pm slump occurs, but how often do you actually load your trolley up with nuts in the supermarket? If the answer is ‘never’, you might want to rethink your weekly shop, as a major study published in the Lancet has found that poor diet is the world’s deadliest health risk, accounting for a fifth of all deaths globally. More than 130 scientists compared dietary habits to rates of death and disease in 195 countries. They found that eating an unhealthy diet that lacks in the vital nutrients and minerals we need claims more lives than smoking – because it raises the risk of serious health complications like heart disease, cancer and diabetes. While too much salt and too few whole grains were noted as some of the biggest issues with our collective eating habits, The Global Burden and Disease study found that the most common healthy foods missing from diets around the world were, surprisingly, nuts and seeds. Nuts might not look like anything particularly special, but these hardy spheres are packed with protein, essential fats and dietary fibre that many of us are lacking. US co-author Professor Walter Willett, from Harvard University, said that the eye-opening study supported recent research on heart and artery disease, that encouraged the idea of more of us replacing meat with plant-based alternatives. If you don’t drink cow’s milk, almonds are a brilliant source of plant-based calcium, which maintains strong bones. They’re also high in vitamin E, which is great for healthy skin and hair. For a morning beauty boost, whizz bananas, strawberries, ground almonds and yogurt together in a NutriBullet to create a super nutty breakfast smoothie. As well as being loaded with protein, peanuts are rich in brain-boosting folic acid and heart-healthy monounsaturated fat. While they make for a great desk snack (opt for unsalted varieties), they can also add an extra tasty crunch to a leafy stir fry dinner. Big, beautiful, buttery Brazil Nuts! Brazil nuts are incredibly rich in selenium (supports thyroid health! ), healthy fats, protein, and fibre. They have a chewy yet soft texture to them and a rich, earthy taste - which is perfect for snacking, creating homemade nut milks, nut butters, or adding into dishes for a creamy texture Don’t forget to add a bag of Organic Brazil Nuts to your cart! Brazil nuts are pretty underrated in the nut world. They’re a fantastic source of the unique mineral selenium, which is said to aid healthy thyroid function, support the immune system and encourage cuts and wounds to heal quickly. An easy way to slip these guys into your diet is by substituting meat for Brazil nuts on your next burrito night. Simply toast in the oven and toss together the nuts, spicy tomato rice and refried beans for a tasty filling. Is there a more delicious combo than buttery walnuts and creamy cheese? Next time you’re wondering what to do with a bag of lettuce leaves, toss in some green apple slices, red onion, feta, walnuts and drizzle with some tangy vinaigrette dressing. As well as being super moreish, walnuts have a higher antioxidant content than most common nuts, and they’re also a great plant source of those all-important omega-3 essential fats. Hazelnuts are often associated with sugary cakes and desserts, but they’re a great addition to savoury dishes too. 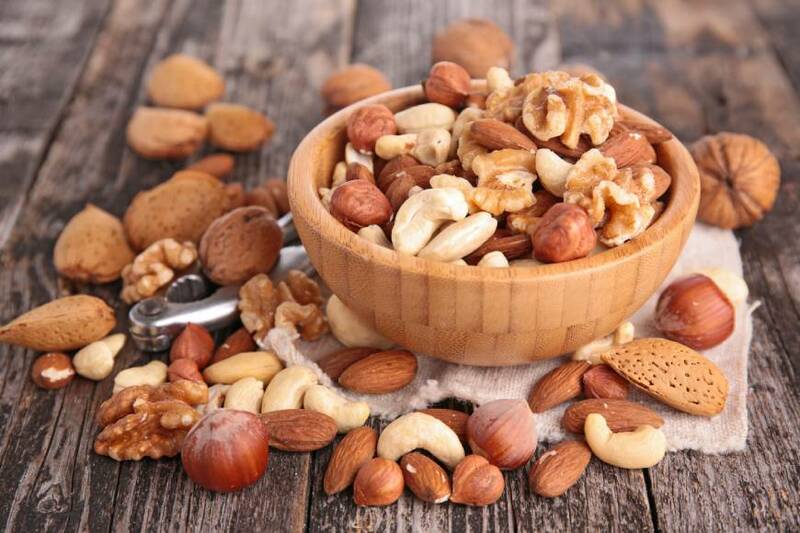 These versatile nuts are also packed with antioxidants, which fight the damage caused by free radicals, which could help ward off major disease like cancer and heart disease. Next time you’re planning a fish supper, brush the skin of a halibut with egg white and coat with finely chopped hazelnuts, before laying it (skin side down) into a hot pan to cook. The result is a super quick and easy dinner that can be thrown together with a batch of asparagus and some garlic-smashed potatoes. .Bon appétit.